The Special Programme for Development of Capacities (SPDC) of International Union of Forest Research organizations (IUFRO) in association with FAO of the United Nations and International Teak Information Network (TEAKNET) based in India jointly organized a Project Formulation Workshop on “Sustainable Management and Genetic Conservation of Planted Teak Resources” during 10-11 May 2015 in Guayaquil, Ecuador. The 3rd World Teak Conference 2015 with the theme " Strengthening Global Teak Resources and Markets for Sustainable Development" is going to be held in Guayaquil, Ecuador during 11-16 May 2015. The International Union of Forest Research Organizations (IUFRO) and the Agriculture Research and Higher Education Center (CATIE) will hold the Third IUFRO Latin American Congress (IUFROLAT) in San José, Costa Rica from 12 to 15 June 2013. 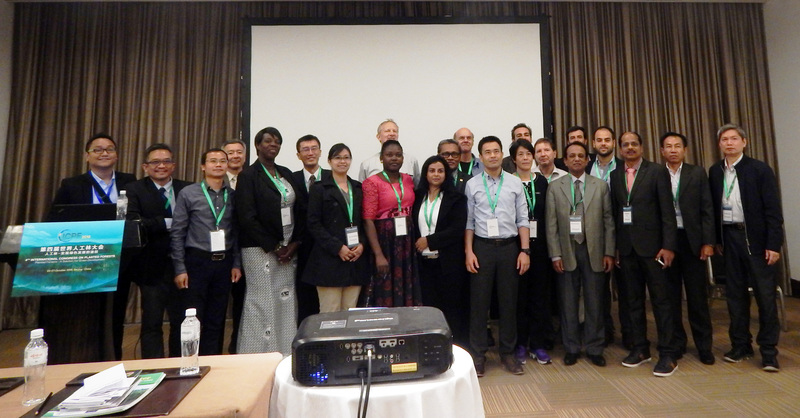 The 8th Pacific Regional Wood Anatomy Conference (PRWAC 2013) , combined with the Annual Meeting of the International Academy of Wood Science (IAWS-2013 ), and co-sponsored by the International Union of Forest Research Organizations (IUFRO 5.01.00), will take place in Nanjing, China, October 17-21, 2013. PRWAC is an important event organized by the International Association of Wood Anatomists (IAWA). This conference started at 1984 in Japan and has been held approximately every four years in the Philippines (1989), New Zealand (1994), Korea (1998), Indonesia (2002), Japan (2005) and Malaysia (2009). Forests and trees provide a wide range of environmental, economic, social and cultural benefits to people in rural communities and urban centers worldwide. Their conservation and sustainable management are closely linked to globally important societal challenges related to environmental protection, sustainable economic development, food security, human health, water and energy resource provision, and climate change. The best available scientific knowledge is needed to effectively address these issues at multiple scales (locally, regionally and globally) and provide a strong basis for forest and forest landscape management practices and policy decisions. The XXXIV. International Conference on Sustainable Agriculture, Environment and Forestry aims to bring together leading academic scientists, researchers and scholars to exchange and share their experiences and research results about all aspects of Sustainable Agriculture, Environment and Forestry, and discuss the practical challenges encountered and the solutions adopted. An international conference on teak will be held during 25-30 March 2013 at Bangkok , Thailand. The conference will involve four parallel symposia on different themes related to teak. First announcement of the forthcoming International conference on “Planted forests on the globe renewable resources for the future” to be held in Estoril, Portugal can be downloaded. International Conference on “Future of Panel Industry-Challenges and Key Issues” scheduled to be held during 26th – 28th September 2012 at IPIRTI campus, Bangalore, INDIA to commemorate the Golden Jubilee Year of the Institute. The Conference will gather nearly 150 - 200 experts from the Scientific, Technical and Industrial communities to encourage the exchange of knowledge and dissemination of information on the latest advances and future challenges in the field of plywood and panel industries.It is also proposed to invite lead speakers from India and Abroad to present Scientific Research papers on the theme of the Conference. Regional Congress to be held in Nairobi, Kenya, focusing on "The Policy/Science Interface for Sustainable Forest Management in the Tropics" (provisional title).